Heigh-ho, Heigh-ho it's off to Magic Kingdom we go! The final gem in the Fantasyland expansion has now been officially unveiled. Get ready for some mining madness with the new Seven Dwarfs ride, located at the site of the old Runaway Mine Train. The coaster is now shorter in length and somewhat tamer to cater for younger guests. We're sure The Mine Train will be pulling in the crowds this summer with its innovative design and irresistible fun factor - who doesn't love Snow White and The Seven Dwarfs? Snow White And The Seven Dwarfs was Disney's very first animated movie. This intriguing tale of lost princess, wicked witch and mischievous dwarfs has not only stood the test of time - it makes an epic theme park ride as well. Of course, this ride has been used before at Magic Kingdom but this new feat is Disney's attempt to create a modern spin on this age old story of good vs evil. The Mine Train is a masterpiece that really shows off what Disney can do, the story might be old but this new ride is anything but boring. 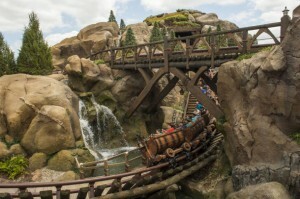 The ride has a unique one-of-a-kind set up with a unusual swinging bucket car that moves side to side as you whiz around hairpin bends and swoop over and under the peaks and troughs of the mine. The coaster begins outside with a fast paced race to the depths of the dwarfs' mine. 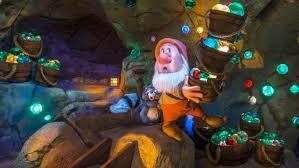 You are taken deep within the cavernous rock, right into the heart of the story “where a million diamonds shine” and animatronic the dwarfs sing merrily away alongside you. Almost as fun as the ride itself, the wait area is seriously impressive. The Disney parks are famous for their genius distraction techniques in their queue areas. Interactive activities, tabletop video games, spinning jewel barrels and a cooling water station. Disney wants guests to feel as though the attraction starts as soon as they enter the ride area, which is something that really adds to the whole ride experience. You're not just sat around tapping your feet and waiting for your turn to come along, you're playing around and forgetting that you're essentially waiting for 30 to 60 minutes. The Fantasyland expansion is the largest in the parks history. It's a clear indicator that the Disney empire continues to go from strength to strength and get bigger, better and livelier each year. 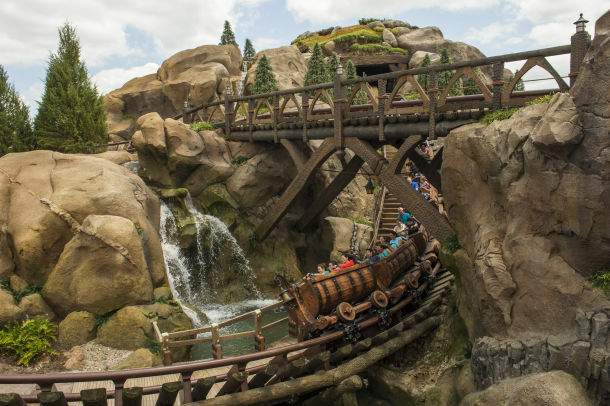 The Seven Dwarfs Mine Train opened on May 27th to rave reviews and is just one of the magical ways that the park has really upped its game over the recent years. In a fast-paced 21st century world, Disney really is doing a gem of a job keeping up with modern audiences.